This week, our featured property is defined by the unparalleled views and bright, inviting interiors. Commanding a serene hilltop, this magnificent Montecito estate offers unrivaled panoramic ocean and mountain views, while approximately 20 acres provides uninterrupted privacy. This sprawling 12,000+/- square foot residence exemplifies Montecito’s casually luxurious tenor with inspiring architectural elements, elegant finishes and breathtaking views gracing each bright and airy room. Stepping into the gracious foyer, a sweeping ocean view is the focal point while a spiraling iron-railed staircase hints at the home’s upper and lower levels. Bathed in natural light, the airy formal living room enjoys a generous, pitched beamed ceiling, an expansive ocean-view picture window and two sets of French doors leading to an outdoor patio and the beckoning grounds. A pair of iron chandeliers and a grand limestone fireplace create an elegant atmosphere. Privately set behind a set of double doors, the sumptuous master suite is a feast for the senses. Immediately upon entering, a sweeping ocean view is the centerpiece to room, enjoyed through a set of French doors opening to a private terrace, which rests beneath a charming vine-covered trellis, and a private coastal-view spa. With two bounteous walk-in closets, an ensuite bath with an impressive walk-in steam shower, oversized air-jet soaking tub and an ocean view, the impeccable master suite is a spa-like retreat. The home’s lower level encompasses what can only be described as a truly great room. 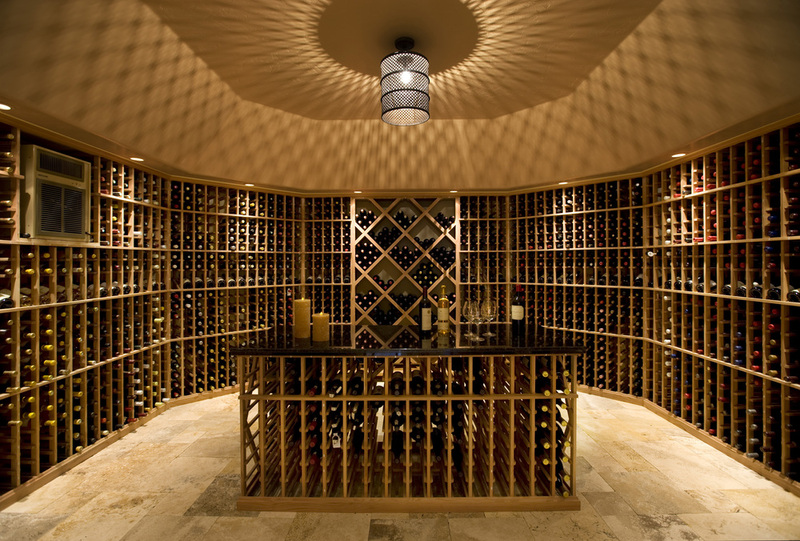 Ideal for a media or game room, the expansive area boasts an incredible 3,000 bottle temperature-controlled wine cellar and a full wet bar, an impressive fireplace and custom-built bookcases, a full bathroom and abundant storage. A wall of French doors open to an outdoor dining room, a tranquil fountain and views of the property’s gardens. Outside, the lush grounds are a fragrant medley of rosemary and wildflower beds. Stone paths encircle a trickling fountain and wind through lush lawns, leading to the sparkling pool. For additional privacy, a spectacular guest house enjoys ocean and mountain views and offers one bedroom with a full ensuite bathroom, a living room and kitchenette, and a charming pitched beamed ceiling. With vast Pacific Ocean views, beautifully appointed indoor and outdoor living spaces and opulent grounds, this expansive Mediterranean estate provides the utmost in Montecito living. Can't get enough of this quintessential Montecito estate? Check out more photos and details or contact Riskin Associates at 805.565.8600 or associates@riskinproperties.com.